Astronomers using Chandra and several other telescopes have studied how a black hole ripped apart a star in a distant galaxy. They used this "tidal disruption" event to measure the spin of the black hole, a fundamental property that has traditionally been difficult to measure. ASASSN-14li was first spotted as an outburst in optical light in November 2014. Chandra, XMM-Newton, and Swift observed the X-rays that were emitted as the stellar debris swirled toward the black hole. 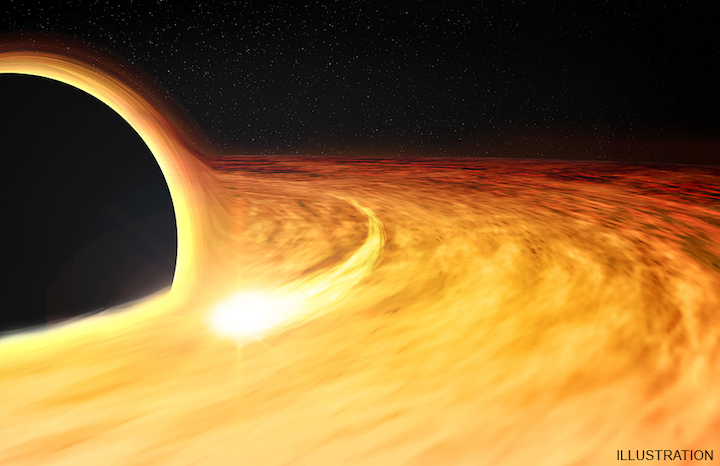 This artist's illustration shows the region around a supermassive black hole after a star wandered too close and was ripped apart by extreme gravitational forces. Some of the remains of the star are pulled into an X-ray-bright disk where they circle the black hole before passing over the "event horizon," the boundary beyond which nothing, including light, can escape. The elongated spot depicts a bright region in the disk, which causes a regular variation in the X-ray brightness of the source, allowing the spin rate of the black hole to be estimated. The curved region in the upper left shows where light from the other side of the disk has been curved over the top of the black hole. This event was first detected by a network of optical telescopes called the All-Sky Automated Survey for Supernovae (ASASSN) in November 2014. Astronomers dubbed the new source ASASSN14-li and traced the bright flash of light to a galaxy about 290 million light years from Earth. They also identified it as a "tidal disruption" event, where one cosmic object is shredded by another through gravity. Astronomers then used other telescopes including a flotilla of high-energy telescopes in space — NASA's Chandra X-ray Observatory, ESA's XMM-Newton and NASA's Neil Gehrels Swift observatory — to study the X-rays emitted as the remains of a star swirled toward the black hole at the center of the galaxy. The tidal disruption in ASASSN-14li is intriguing because it allowed astronomers to measure the spin rate of the black hole. A black hole has two fundamental properties: mass and spin. While it has been relatively easy for astronomers to determine the mass of black holes, it has been much more difficult to get accurate measurements of their spins. This debris from the shredded star gave astronomers an avenue to get a direct measure of the black hole's spin in ASASSN-14li. They found that the event horizon around this black hole is about 300 times the diameter of the Earth, yet rotates once every two minutes (compared to the 24 hours it takes to complete one rotation). This means that the black hole is spinning at least half as fast as the speed of light. Scientists have determined spin rates for some stellar-mass black holes (those that typically weigh between 5 and 30 solar masses) in our Milky Way galaxy by observing rapid and regular variations in their X-ray brightness. 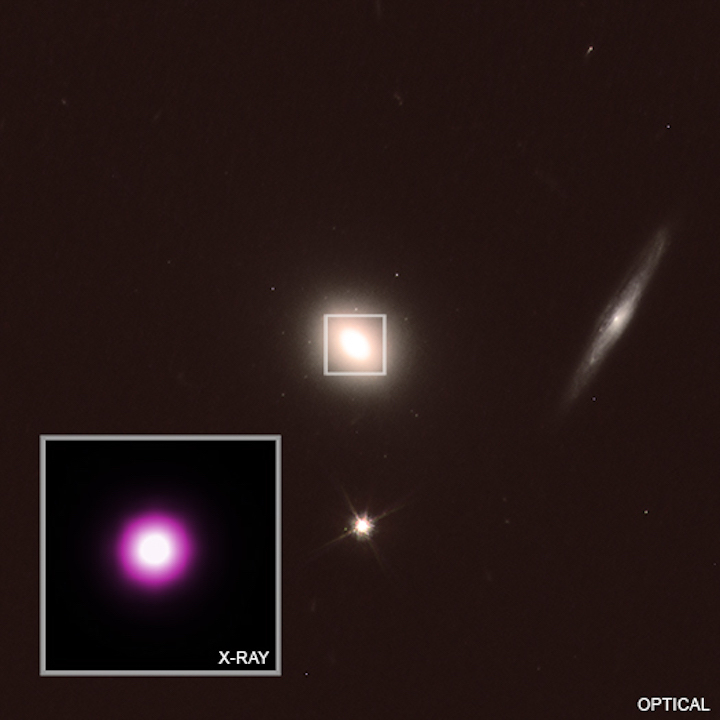 A few supermassive black holes have shown similar variations, but they were only observed to repeat over a few cycles, rather than the 300,000 cycles seen for ASASSN-14li. With only a few cycles, the association of the variations with the spin of the black hole is not secure. These results will likely encourage astronomers to observe future tidal disruption events for long durations to look for similar, regular variations in their X-ray brightness. These results appear in a paper in the latest issue of the journal Science, and were presented at the 233rdmeeting of the American Astronomical Society meeting in Seattle, WA. A preprint is also available online.